One of my favorite things to see at any automotive show are the antique vehicles. The 2018 New York International Auto Show has some beautiful, rare models on display. 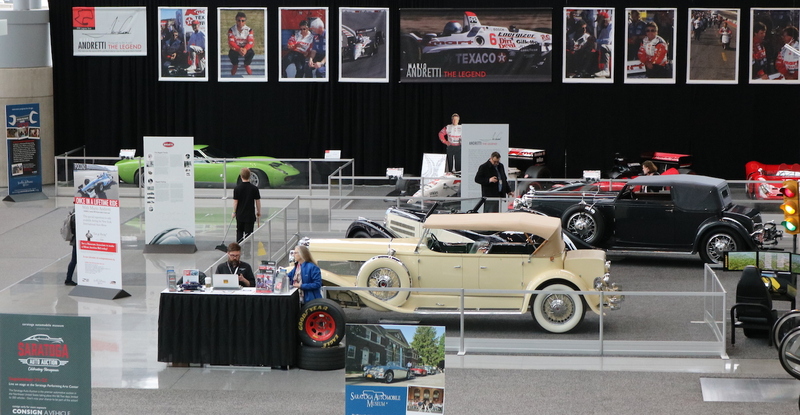 The exhibit is being curated by the Saratoga Automobile Museum, which is sponsored by the Silver Arrow Society, a local group of auto enthusiasts. The Museum opened in 2002, and "The Museum’s mission is to preserve, interpret and exhibit automobiles and automotive artifacts. We celebrate the automobile and educate the general public, students and enthusiasts regarding the role of the automobile in New York State and in the wider world. In addition to technical and design aspects, our educational focus is on the past, present and future social and economic impact of the automobile." The Saratoga Automobile Museum is located in Upstate New York, north of Albany, and "is located within the 2,500 acre Saratoga Spa State Park, in the heart of historic Saratoga Springs, New York, world famous for its legendary, much honored one-mile thoroughbred track. The museum’s facility is the totally restored and renovated Saratoga Bottling Plant, a beautiful neo-classic structure built in 1934. The Museum is adjacent to the Saratoga Performing Arts Center and near the landmark Gideon Putnam Hotel. Within walking distance in the Park are the National Museum of Dance, the Spa Little Theatre and the lavish Hall of Springs banquet facility." The car that caught my eye at the 2018 NYIAS was the 1931 Stutz DV-32 Convertible Victoria by LeBaron. The Stutz Motor Company was founded as the Ideal Motor Car Company in Indianapolis, Indiana in 1911, and continued until 1935. In 1912, Harry C. Stutz renamed the company Stutz Motor Company and began selling high-performance roadsters, such as the famous Stutz Bearcat (which appears in the Velvet Underground's 1970 song "Sweet Jane"). This collaboration was not unusual for luxury cars at the time. Luxury makers would ship rolling chassis to companies such as LeBaron (later purchased by Chrysler Corporation) where they would then be completed with custom body work. 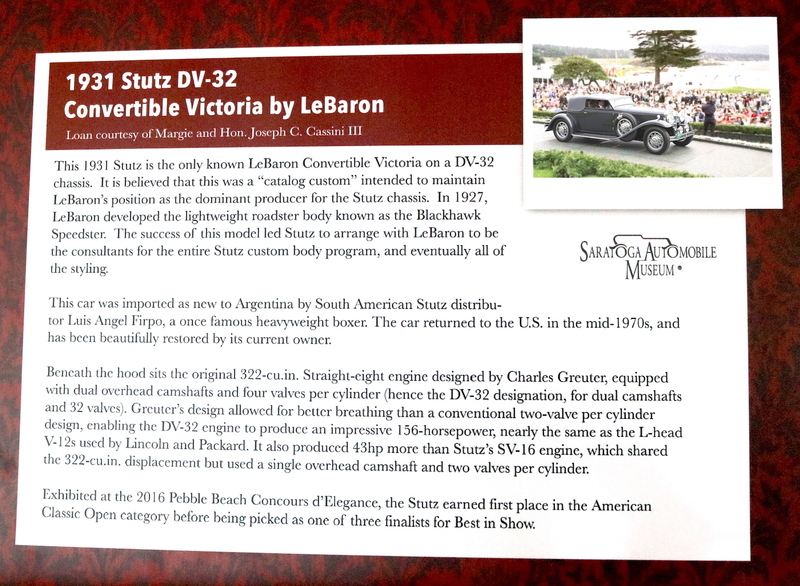 The sample featured here is apparently a "catalog custom," built as a one-off in order to insure LeBaron's position as a consultant for Stutz's custom body program (see placard below). When automakers of some expensive cars were quickly trying to produce multi-cylinder engines during the so-called "cylinders race" of the early 1930s, in 1931, Stutz developed the DOHC 32-valve in-line 8 called the "DV32" (DV for 'dual valve'). 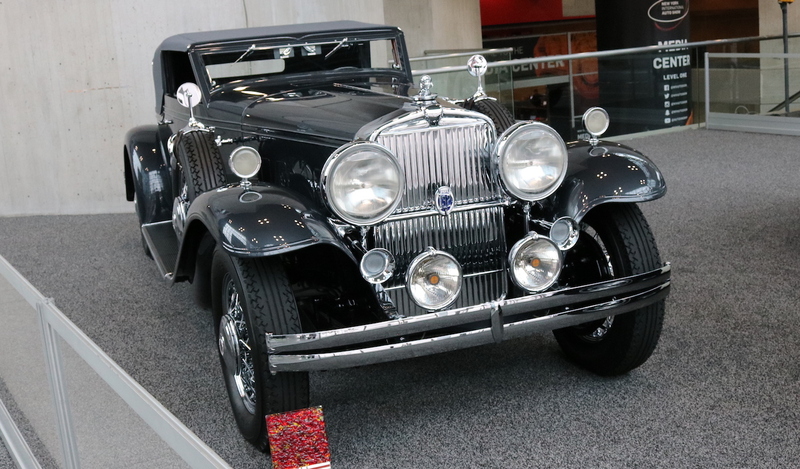 Unlike other manufacturers who were producing V12 and V16 engines, Stutz stayed with the dual overhead cam 8 design like sporty cars by Alfa, Bugatti, and Duesenberg. These cars were advertised as capable of exceeding 100 MPH. The Stutz DV-32 chassis made its debut at the 1931 New York Auto show, which became the platform for a range works by coachbuilders LeBaron, Fleetwood, Rollston, and Weymann. However, many of the Stutz chassis were built by Rollston Company of New York City, Manhattan’s most prestigious coachbuilder at that time (this is one of the six convertible Victoria chassis built by Ralston). Approximately 200 were made with production ending around 1934. So this is, indeed, a very rare car. The 1931 Stutz DV-32 Convertible Victoria is a majestic motorcar, and I know I am in good company regarding my tastes in fine automobiles, as several notable celebrities have owned Stutz cars, including Lucille Ball, Sammy Davis, Jr., Dean Martin, and Frank Sinatra.